Bensons for Beds is one of those employers who make the process of finding out about their vacancies and then applying for a job pretty easy. That’s becoming more and more common for retailer nowadays perhaps because the industry tends to turn over a lot of staff, retail firms need to make their job opportunities more accessible than those in other industries. As you’d expect there are often loads of Bensons for Beds jobs at any given time. There are over 300 stores in the UK so warehouse and customer services staff are key to the smooth operation of the firm as a whole. The firm’s warehouse and transport teams have been outsourced to Concorde Logistics so you’ll need to head to concordelogistics.com/careers if you’re interested in that side of the business. For information on customer service roles click on bensonsforbedscareers.co.uk. Sales staff are cut a massive part of the firm’s success. They need to be enthusiastic about the product and be able to think on their feet when face to face with customers. Things like the 40 night comfort guarantee that’s offered with every bed that’s purchased give the customers peace of mind but you’ll still need to employ your sales skills to gain the great salary, the bonuses on offer and the other incentives that come with this role. You’ll find more info at bensonsforbedscareers.co.uk. 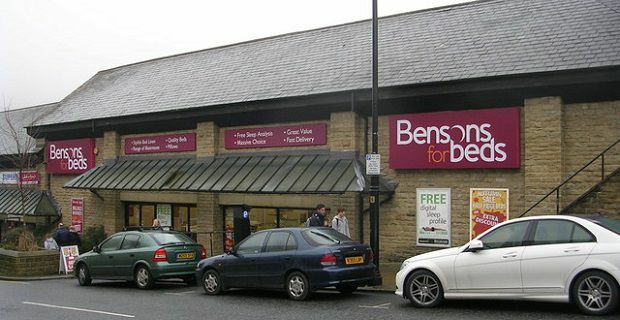 The Service Centre, which is based at Huncoat in Lancashire, is the hub from which the bed retailer operates. This is where you’ll find work if you’re experienced in HR, IT, Purchasing, Finance or Marketing. As with the other jobs with Bensons for Beds, head along to bensonsforbedscareers.co.uk for more information and the opportunity to apply directly to the firm.